Becoming a Paramedic is no easy task. You spend scores of hours in the classroom, hours of ride-time on the ambulance and time in the ER. The entire experience can be stressful. After the long and demanding journey to obtain your certification the last thing you need is added stress during your practical exam. 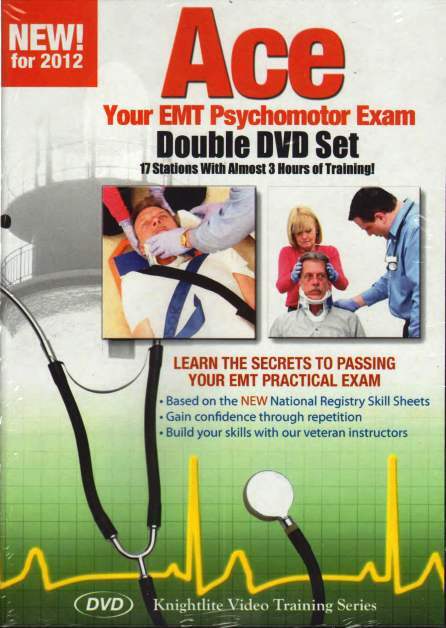 That is why Knightlite created Ace Your Paramedic Practical DVD. Under the calming direction of Paramedic Instructor Gary Havican, you learn how to relax and move smoothly and confidently through each station. Ace Your Paramedic Practical is made up of 11 stations, and offers over 90 minutes of instruction. A brief introduction to the station. The actual station being performed. A review of the National Registry Skill Sheet. A review of the station’s Critical Criteria. Don’t wait until the last minute. Start preparing for your practical exam now! Re-testing adds more stress and expense.